Exceldor is a Canadian poultry processing co-operative. Its headquarters is located in Quebec, Canada. Exceldor was originally founded in 1945 as the “Société cooperative avicole régionale de Saint-Damase,” a regional co-operative that specialized in poultry. About 225 members joined the co-operative in the year of its foundation. After the co-operative was established, a slaughterhouse was soon constructed at a cost of $85,000. The slaughterhouse was capable of processing 3,000 birds everyday, making the co-operative the first major poultry-processing company in the area of Quebec. During its first year, the company had sales of $200,000. After nine years, sales reached the million dollar-mark and the company’s facility was the first to experience a federal inspection. In the 1950s, the Société cooperative avicole régionale de Saint-Damase had increased its production to ten times the quantity it processed before. Its methods were soon modernized and the facility included equipment for a quick-freeze system. On the other hand, the Coopérative de Dorchester invested a large amount of capital for its facilities to be able to simultaneously process light and heavy birds. In the succeeding years, both co-operatives enjoyed steady growth, and were acknowledged as among the most thriving companies in Quebec. In January of 1995, the two co-operatives merged and became known as the “Groupe Dorchester/Saint-Damase, La cooperative avicole.” This merger allowed the newly formed co-operative/company to control more than 30% of the poultry industry in the area of Quebec. In 1998, the co-operative’s name was again changed to Exceldor Poultry Co-operative. 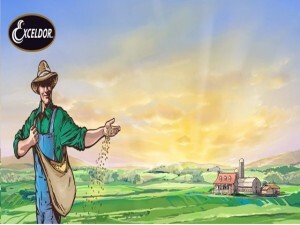 Today, Exceldor continues to specialize in the processing and marketing of poultry products. The company currently has about 900 employees and processes roughly 1.4 million chickens every week at its three processing facilities in Saint-Damase and Saint-Anselme. Today, Exceldor is considered one of the leading companies when it comes to the field of poultry processing in Canada. The company also owns two more poultry companies, Volailles Giannone and Unidindon.